This happened, sadly for all enthusiastic gamers, right in the middle of Steam's recently begun Winter Sale season, whereas many of the users were just in the middle of bargaining for great deal of discount games, with shopping cart full of goodies ready to go. Some of those, certainly as Christmas gifts for friends. Steam Winter Sale is always much awaited event by gamers worldwide. Steam's status website at Down Detector service (http://downdetector.com/status/steam) as for one, including many other websites such as Reddit's gaming sub-forums, quickly filled with swarms of enraged gamers' messages demanding an answer, why Steam wasn't working. 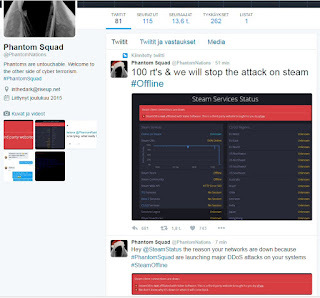 The answer was given rather quickly, though, not by Steam themselves, but by a hacker group called "Phantom Squad" on their Twitter page (@PhantomNations), claiming the responsibility of "hacking" Steam by DDoS attack (Distributed Denial Of Service), preventing Steam's services functioning completely. 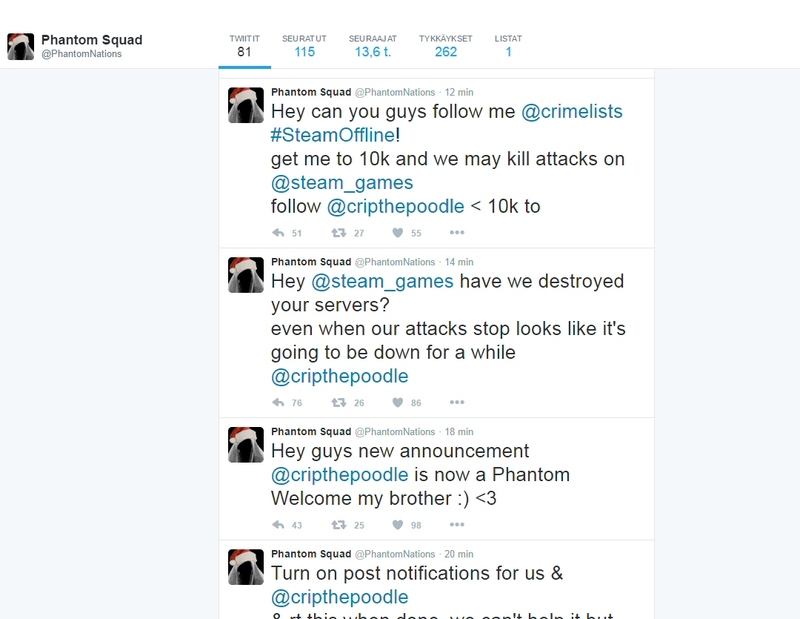 The attack is still on as we speak, with no knowledge when it will end, or when Steam will come back up online. But, why? A call for an attention? Money? Many disappointed gamers are probably wishing Steam to extend their Winter Sale period due being unable to use the initial offers because of the DDoS attack by Phantom Squad; that is, at least, if the attack manages to keep the servers and services of Steam down for long period of time. 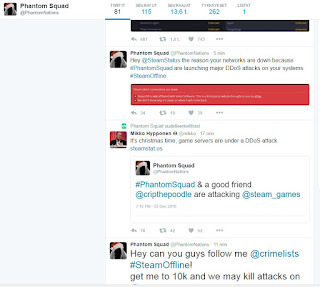 Phantom Squad has stricken gaming networks before, during a holiday season. 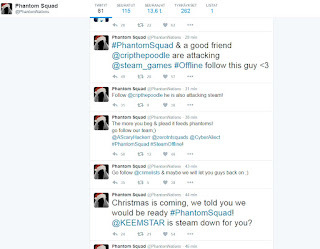 December 2014, Phantom Squad claimed responsibility for taking out Xbox Live's network. It's also believed that the group has made a short attack(s) previously towards Steam, but nothing this major. 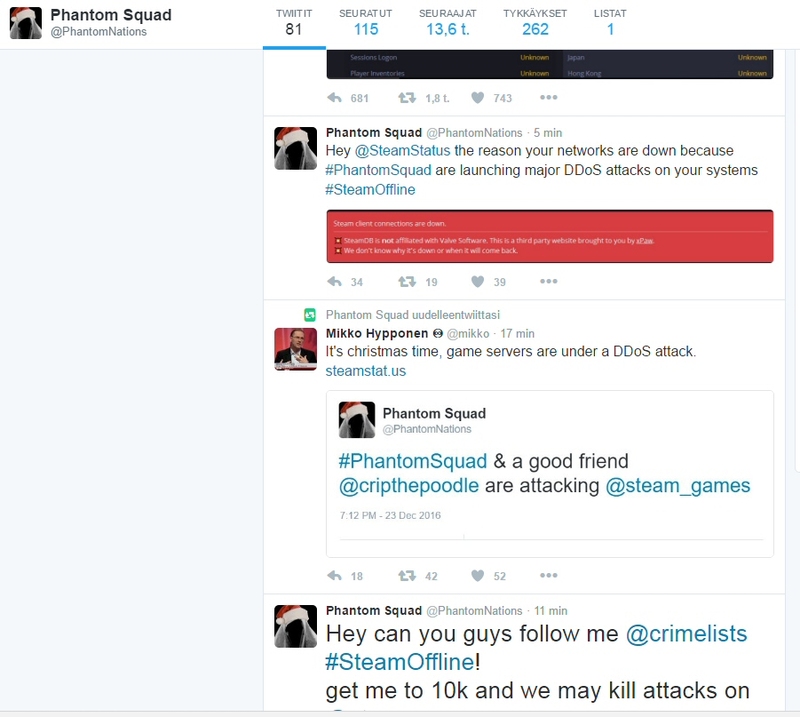 This comes all bad news to gamers using Steam, and other gaming networks might not be safe, either. 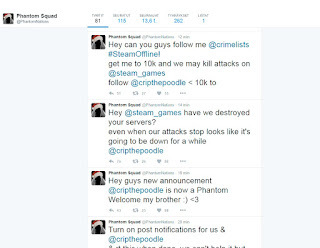 The successful attack raises concerns about Steam's ability to keep it's service and servers protected of hacking and flooding attacks - and most of all, it's paying customers. If they cannot counter the attack shortly, it will be an embarrassing moment to be remembered. I, personally, would wish that hackers such as these would turn their hacking skills into something more useful, though. My finger points towards the East, but I'd rather not go deeper into the politics on this matter. 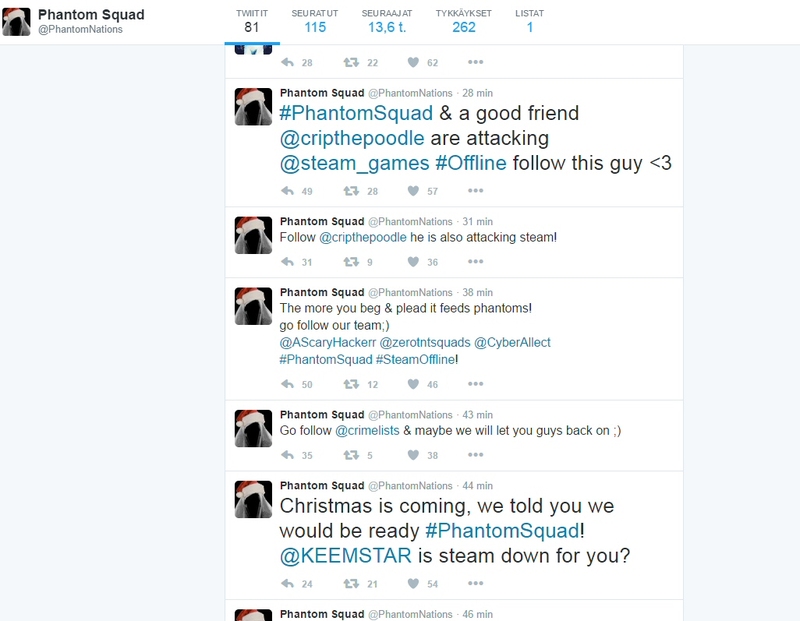 Phantom Squad's Twitter account was closed. The website seems to be up now, but doesn't work very well. The attack is still probably on at some level.